We are approaching the ending of STEM4youth project, and we would like to celebrate with a great closing event in Milan! We are pleased to invite you to the STEM4youth Final Conference – an international meeting organized to present STEM4youth work and results, with panels, guests from STEM (Science, Technology, Engineering and Mathematics) education and job market, as well as practical workshops and many more. The event will take place on 11th October 2018 in Milan, in the Napoleonic Hall of the University of Milan. During the STEM4youth Final Conference we will present the two-year project results, as well as a future roadmap with recommendations for the uptake of the best STEM learning practices by local, national and Europe-wide education systems. Distinguished scientists, EU policy makers, school editors, science professionals and teachers from all over Europe will take part in STEM4youth Final Conference, to discuss recent trends and future directions for STEM education. At the end of the event, you will receive a certificate of participation. Are you a teacher, a science professional or an educator involved in STEM education? 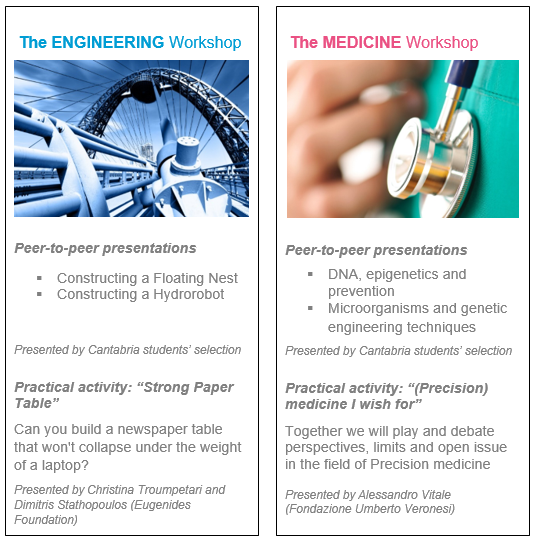 Also, you can attend two different afternoon workshops based on STEM4youth modules – that will allow you to have a guided experience on the disciplines of Engineering and Medicine. Would you like to know more and join? Sign up now, places are limitated! Would you like to participate in an afternoon workshop? Thanks everyone to your warm participation! We have got many nice projects of student teams and had hard time to choose only the best six of them. Those six teams will be interviewed during next week and only three will be chosen to win the main prize of the Competition – the trip to European Facility of Nuclear Research (CERN). One additional team will join those three and it is you to decide which one! Visit our voting page (https://olcms.stem4youth.pl/competition/vote/2), take a look at the project summaries and vote for the teams you think are the best. You can vote once per day. The voting closes on April 26th at 5:00pm (CEST). As a part of the STEM4youth student competition, STEM4youth will shortly organize 4 on-line coaching sessions (one for each competition topic). 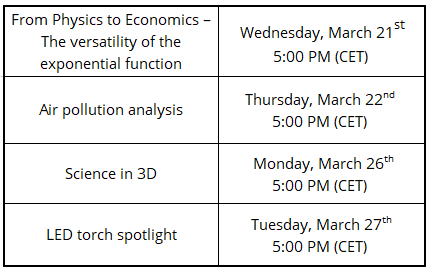 These online sessions will be chaired by the authors of the problems, and will be primarily dedicated for the students and teachers who have already worked on appropriate topics. During each (appx. 45-60 min.) session, STEM authors will answer both students and teachers questions, as well as doubts about evaluation criteria and further problems details. If you cannot joint sessions, short summaries will be published on OLCMS platform and as update at the end of this webpage – available after the online events. Participants will join sessions using teleconference Vidyo software. To participate in the sessions, you need first to install a Vidyo client on your desktop or mobile device. You will find below an easy two-step installation guideline. During installation as Vidyo portal name please enter: “vidyoportal.cern.ch”. At this point, please do not login. You will find detailed information below in order to test your access. Participation in the sessions do not require prior registration. STEM Discovery Week is coming! STEM Discovery Week 2018 is a joint international initiative that invites projects, organisations and schools across Europe and around the world, to celebrate careers and studies in the fields of Science, Technology, Engineering and Mathematics (STEM). The tagline for this year’s campaign “say yes to STEM” describes the partners’ open-minded and dedicated support to STEM subjects at school, as well as wide-ranging collaboration among stakeholders in the area. Organise and share information about activities in STEM education as part of the STEM Discovery Week campaign. Encourage third parties to support and join the initiative by organising STEM activities of their own and share information about them as part of the STEM Discovery Week campaign. Include it on the map! Participants organising STEM activities in the course of April 2018, may also enter the STEM Discovery Week competitions. Visit the competitions’ section for more information here. STEM4youth invites students and their teachers from high schools across Europe to join the STEM4youth Competition, showing your creativity and your problem-solving ability to work on one of our multidisciplinary problems. GEARING UP TO LAUNCH SCIENCE & TECHNOLOGY. FOR TEENAGERS. A two-day get together opened up the project and its work plan among partners and the funding authority of STEMFORYOUTH, the European Commission. Secure your spot at one the most buzzing events on education of all Europe. This year’s theme is ‘Imagine…’.